In a move guaranteed to delight half of you and mortally offend the other half, Volkswagen revealed yet another electric concept car. It's called the I.D. Buggy, which is a great name because it's an electric buggy. The inspiration is, of course, the dune buggies of the 1960s, which were built from the ubiquitous VW Beetle. Here, it's given a futuristic facelift. 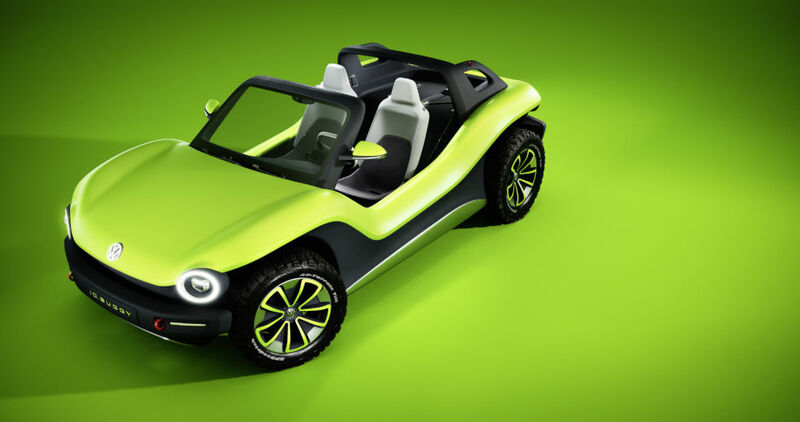 Instead of the venerable flat-four engine at the back, the Buggy gets VW's new MEB architecture, which provides the lithium-ion power pack and electric-motor setup. MEB is the toy box of parts and software that VW will use to create a new range of electric vehicles. Over the past few years, the company has been reinventing itself for life after diesel, doubling down on electrification as the answer. Roadmap E was the answer, which promises 50 new battery EVs from the VW Group as a whole by 2030. Porsche and Audi are working on a separate architecture called PPE, which will show up in larger vehicles like the next Macan SUV. But for anything a bit smaller, MEB is where it's at. At VW the brand (not VW Group the corporate overlord), the whole electro-mobility thing is happening under the I.D. banner. The first I.D. production cars will be aerodynamic hatchbacks that go into production in Europe late in 2019. Sadly, those hatchbacks will probably not be available in North America. Here in the United States, VW's Chattanooga factory in Tennessee will start building a production version of the I.D. Cross crossover in 2020.